Warning: This slide is 24' High. We could not make it any bigger for your appreciation in this graphic, nor a perfect picture to show you how big it is could be taken. Description: After numerous requests for a steeper, taller & faster Wild Rapids, here you go! 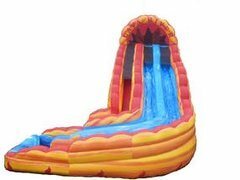 KINDAS Introduces our New Inflatable Water Slide 24’' tall Lava River with Pool. This New 24 footer Inflatable Water Slide is not only taller, but they have a steeper sliding angle that make them faster than our original 18' Wild Rapids. With our unique new non slip material on the entrance ramp they’ are destined to become a customer favorite.